I am overdue for a newsletter. I hope you’ll forgive me. New and interesting things have been happening on several fronts. Work on Nadya continues. Its second draft (which I call the Cass draft, in honor of the wonderful woman to whom it is read during this stage of drafting) is nearly finished. I have had no luck whatsoever in finding cover artwork for it, which means I may soon have to resort to doing something for it myself---always a risky proposition. Speaking of artwork, Three Dances is still stuck at the copy editing stage. I may soon employ drastic measures to get it finished. And Soulwoven has been clipping along fantastically! You all, with your votes and your reads and your comments, are doing amazing things with it. I’ve been busy with other projects (mostly work and/or life-related, to be honest), and in my relative absence it has been flying. It crossed 100,000 reads on Christmas day. Three short weeks later, it has crossed 126,000. Nearly 1,700 people have read it in its entirety. I am awed and humbled. Thank you for your support. I spent the weekend in Montana, where Cass investigated a graduate program that involves placing GPS equipment on 6,000-meter peaks in Central Asia, and I investigated several varieties of beer, a mountain, the local bus system, and other sundries. Soulwoven bonus content to come soon. It’s long overdue, and I am remiss in not posting it. Jeff, I'm excited to hear more details on Soulwoven as well as Nadya. Particularly long term goals, dreams, etc. 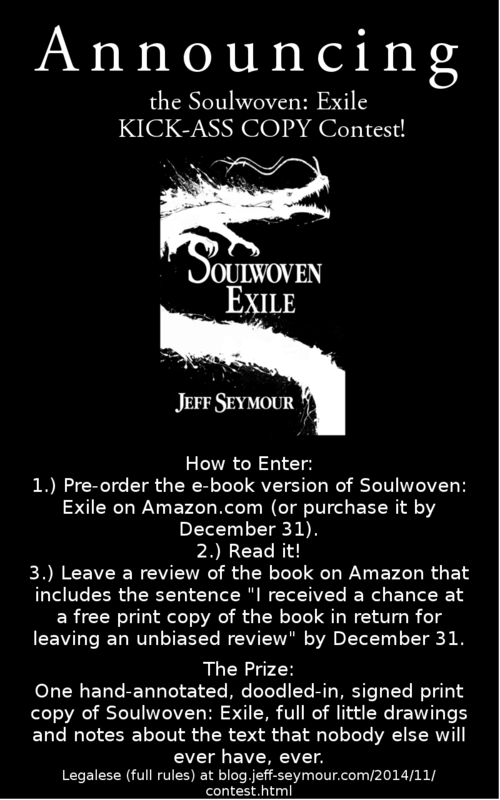 Additionally, now that Soulwoven is up in its entirety, I'd like to sit down and read it. That is when I can make the time between my own writing. For your cover art, are you looking for someone to do it for free or are you looking to pay someone? If the latter, what's your budget? I might have a few options for you. Looking forward to reconnecting sometime in the near future. Hope all is well, my friend.